For the first time since cutting interest rates to 0.25 percent, Federal Reserve Chairman Ben Bernanke outlined his plan of action. In a speech at the London School of Economics, Bernanke talked about the additional tools available to the Fed, an orderly exit strategy, concerns about inflation and suggestions about how the Obama Administration should use the remainder of the TARP funds. Most importantly, Bernanke created a new name for his regime – credit easing. In contrast to Quantitative Easing, which Bernanke explains focuses on the liabilities portion of the central bank’s balance sheet, Credit Easing focuses on expanding the asset side of the balance sheet. However since the balance sheet is suppose to balance, this may just be a difference of semantics since both efforts ultimately add liquidity into the financial system. The Federal Reserve wants to draw a distinction between their current policies and the Bank of Japan’s policies between 2001 and 2006. As for the tools that they have at their disposal, there was nothing groundbreaking. Their number one tool is policy communication, followed by liquidity facilities for banks, facilities for other markets and purchases of long term securities. Like Federal Reserve President Lockhart, Bernanke expects interest rates to remain low for an extended period of time. As we expected, inflation is not a concern because the Fed believes that weaker growth will keep inflation low. In terms of an exit strategy, he expects demand for the emergency facilities to wane as the US economy improves. 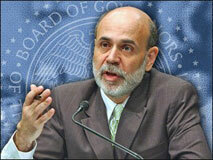 Like many members of the Bush Administration, Bernanke supports using the rest of the TARP funds on the credit markets. Without stabilization in the financial system, he does not believe that any fiscal stimulus will have a lasting impact on the economy. Insurance Education – How Are Annuities Paid ?